New data continues to confirm what has been obvious for decades: federal interference in education since 1965 has failed to improve the academic achievement of poor children. This difference between students from higher and lower income families, dubbed “the achievement gap” by experts and policy makers, has remained stubbornly persistent for fifty years. 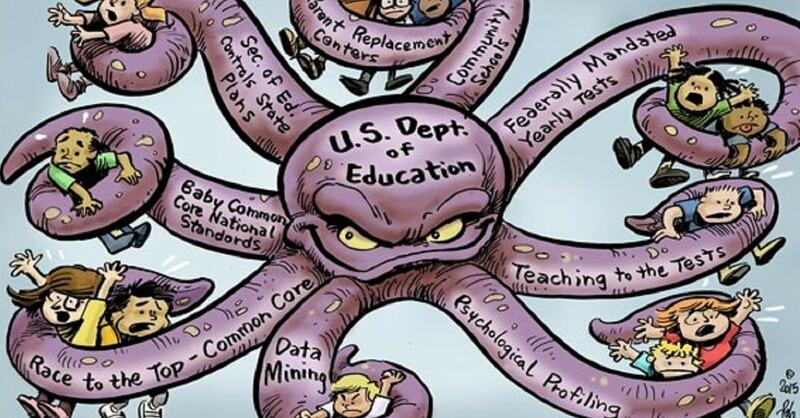 That federal interference started with the Elementary and Secondary Education Act (ESEA), which began compensatory grants for poor children in K-12, and Head Start, the federal preschool program, both passed in 1965. Both laws, plus the General Education Provisions Act (GEPA), started out relatively benignly with all sorts of comforting language about how the federal government was not going to interfere in local autonomy regarding curriculum, etc. However, both federal education laws have gradually increased the iron grip of federal control over states and school districts over the last fifty years. These three statutory provisions protecting local control have essentially been ignored. First, the feds imposed statewide standards and tests on states as a prerequisite for federal funds in the 1994 reauthorization of ESEA, called the Improving America’s Schools Act. Not only did they take away school district autonomy in choosing standards and tests, but they also required those standards to comply with the federal Goals 2000 standards. Goals 2000 was an intensification of federal control of both state and federal pre-K programs that had to comply with Head Start — and also marked the first time that “social emotional learning” appeared in the federal education lexicon. Then came the 2001 version of ESEA, called the No Child Left Behind Act (NCLB). It ratcheted up federal control even more by requiring statewide tests in math and English/reading every year in grades 3-8 and science once in elementary, middle, and high school. SEL and preschool elements from the 1994 bill also survived in the new version. However, the worst part of NCLB was the completely unrealistic 100-percent proficiency requirement in math and English by 2014 for every subgroup under the threat of districts losing federal funding. We have all seen what an academic disaster Common Core has been. 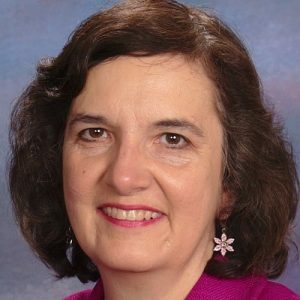 The academic decline of American students related to Common Core was both predicted and has been thoroughly documented by university professors like mathematician James Milgram, English standards expert Sandra Stotsky, and literature professor Mark Bauerlein, all of whom were involved in the Common Core development process but spoke out against the inferior standards at the time. These experts and many more, as well as teachers and parents have continued to document and speak out against the enormous flaws of the Common Core system of academically inferior, developmentally inappropriate, and psychologically manipulative standards; not-well-validated national tests; and invasive data collection. The list is incredibly long, so I won’t take the space to mention everyone here at the risk of missing anyone’s great contribution. Particularly relevant to the discussion of the achievement gap is the exponentially increased harm of Common Core to the academic achievement of poor children. This has been well documented in many places: Williamson Evers and Ze’ev Wurman of the Hoover Institution for California; Stotsky for Massachusetts; establishment outlets discussed the widening of the gap as evidenced by the 2017 Nation’s Report Card (NAEP) results; and I have discussed the widening of the NAEP achievement gap for Florida and with the ACT since the Common Core was imposed. The results for Head Start and state preschool programs are absolutely no better. Results range from little to no effect, fade out of beneficial effect in early elementary school, or academic and emotional harm. Moreover, these problems are acknowledged by the American Enterprise Institute, Brookings, and a consensus of early childhood experts. A number of scholars are finally beginning to acknowledge the true source of the problem that fifty years of “Fed Ed” has not come close to solving. Articles are cropping up about the toxically deleterious effect being raised in a single-parent family has on achievement. This relationship was first noted in the seminal 1966 Coleman report, which found that school factors were not nearly as important as what happened in the home — particularly whether there were one or two parents, maternal education level and parental involvement in education. In addition to being discussed here many times, this topic has received attention from noted scholars such as Sandra Stotsky, the invaluable website Marripedia, and groups on the establishment end of the spectrum such as AEI. We have also repeatedly discussed William Jeynes’ work showing that the gap is eliminated for minority students when there are two parents and religious involvement. Relative to white familes [sic], Asian households are much more likely to be headed by married parents—especially those earning an income below the federal poverty line—and more likely to have moms and dads who expect their children to complete at least a four-year degree. It thus seems quite plausible that Asian students outscore their white peers, despite having similar rates of poverty and parent education and monumentally higher rates of being English language learners, in part because they are more likely to live in two-parent households and with parents who expect them to earn a bachelor’s degree. 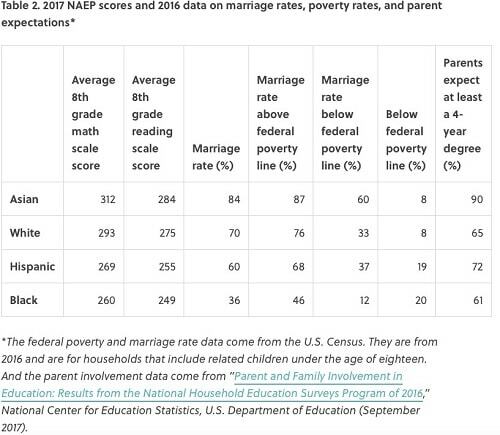 Similarly, the marriage rate among Hispanic households with children under the agree of eighteen is almost double that of comparable black households—and when you look at families living below the poverty line, the rate is more than three times higher. Hispanic parents are also 18 percent more likely to expect their children to earn at least a bachelor’s degree than black parents. This would help explain why Hispanic students outscore their black peers, even though they’re much less likely to have a parent who is a college graduate, much less likely to speak English as a first language, and equally likely to be poor. Sadly, now that it has become much harder to push Common Core and preschool as education silver bullets, the big government and corporate establishment of both parties is turning to social emotional learning (SEL) and home visiting. The many problems with SEL have been thoroughly documented in this space and in the Pioneer Institute white paper “Social-Emotional Learning: K-12 Education as New-Age Nanny State,” coauthored by Jane Robbins and me. These include lack of evidence for improved academic achievement, further dilution of academic teaching, and entanglement of these subjective SEL standards with Common Core, which is portrayed as rigorous academics. Home visiting’s lack of data showing improved academic achievement along with its invasiveness has been discussed at The Federalist. After fifty years, the bottom line is this: the major problem causing the achievement gap is the government-created crisis of subsidizing out-of-wedlock birth. The feds should not be creating and funding more programs to deal with the consequences. Instead the government should be removing that incentive by promoting two-parent family formation in welfare reform and similar government programs. Statistics can explain more than one thing. In this case traditional families are best for “school” achievement. But not really stressed in this article is that it has been the education system itself which has deliberately and successfully worked against the concept of traditional family since the mids 1960’s. Therefore schools themselves are a success story for the undoing of traditional families. I am a retired teacher and unequivocally proclaim that there is no hope for America as long as Christians and conservatives allow our children to be indoctrinated in the pagan (a.k.a. “public”) schools. We must rescue our children! See specifics at http://www.insectman.us/exodus-mandate-wv/index.htm I am not raising funds. My goal is to rescue children. Two parents gives more emotional and financial support. There is more guidance. The best thing that happened to me as a student is my parents stayed together.